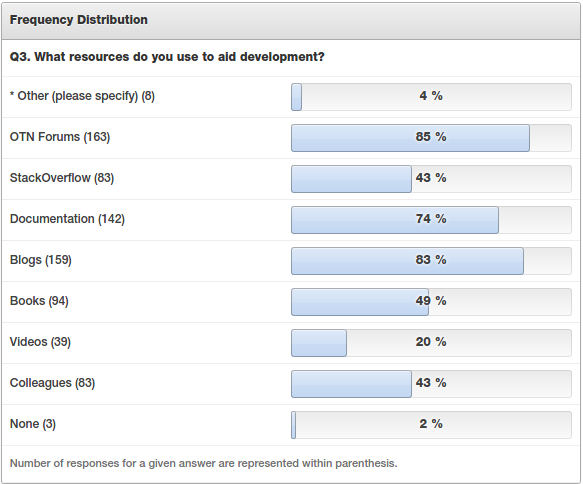 Grassroots Oracle: APEX Survey Results: What development resources? The next question in my 2015 survey was a high level look at what resources developers use to get through your day. On a slightly side note, there was an interesting discussion on the science of preferred vs effective learning styles in this podcast. It reminded me of my scuba diving course where we learnt the content using 5 different methods, which was a great way to ensure everyone understood how to survive in a pressure environment (pun intended). It's great that some people have the opportunity to learn from colleagues. I've had some great mentors in the past that really helped my career. Blogs can be a moderate second, with APEX content aggregated at www.odtug.com/apex. Documentation is a great source of truth, and I recommend four places. Sense a trend? Some of the "Other" responses included Twitter, which is a great tool for picking up information coming out of conferences you can't attend, tech information in general, and amusing parody accounts. Slack is also worth a go. One interesting response was "Package Specs, Views, Application Code". I often find the package specifications of Oracle Supplied Packages full of useful information not necessarily found in the documentation. I recommend you start with APEX_APPLICATION and APEX_APPLICATION_GLOBAL. As for views, I've learned a thing or two an how APEX ticks by looking at the SQL for dictionary views, which also explains why many don't return any records when you aren't within an APEX application. I'm curious what was meant by application code, perhaps the same as another response that said "Packaged Applications". These applications improve every release and are a great demonstrator of APEX capability. Check them out for application design ideas, and if you want to know how something was done, install (and unlock) the application and look under the hood. This is where I learned how to display images in interactive reports. Webinars was another suggestion, which I guess is a subset of Videos. I recommend paying for membership at ODTUG where they have a brilliant library of webinars, of which I have many yet to catch up on. These days videos are quite diverse, from quick and simple youtube demos like Connor McDonald's KISS series on analytics; to published screencasts like I did once. Someone even suggested "Connor McDonald", though I think there was some bias in that one. My final recommendation would be regardless of preferred source, diversify your content. Don't just read Oracle APEX stuff, but subscribe/buy/view content for related technologies, and why not the competition?